It’s hard to say with certainty when exactly counterfeiting became a problem for the human race, but a safe bet is just a couple seconds after Adam and Eve were expelled from the garden. I like to imagine that a few particularly shrewd chimpanzees noticed that clothed was the new naked, and within minutes they were standing behind hastily-constructed kiosks built of twigs and vines, hawking “Genuine Edin™ Fig-Leaf Clothing” to any passerby unlucky enough to make eye contact with them. Of course, Adam and Eve were the only two humans alive at this point, and they could probably spot a forgery pretty easily, but still—it was a start. Granted, that’s wild and unwarranted speculation on my part, but it seems to have amused you enough to get you reading this next paragraph about events actually recorded in the Bible. Merriam-Webster defines a counterfeit as something “made in imitation of something else with intent to deceive.” Whether or not its origins involved crafty simians, the Bible supports the notion that this particular brand of deception has long been a proud and time-honored tradition of humankind. Take the example of Jacob, who used counterfeit hair in order to pose as his brother to his nearly blind father (Genesis 27:16), or Laban, who set up his own daughter as a counterfeit bride in order to trick Rachel’s would-be groom (Genesis 29:23), or Joseph’s brothers, who counterfeited his own blood with goat’s blood in order to pass him off as dead (Genesis 37:31)—and these examples are only from the very first book of the Bible! Not much has changed since then, except maybe in quantity. Estimates put the value of the world’s counterfeit goods in 2008 at roughly $650 billion. By 2015, trends suggest that value will exceed $1.7 trillion. One point seven trillion dollars. That’s a figure professional statisticians refer to as “a great big honking wad of money.” For some perspective, consider that the gross domestic product of the entire United States last year was only $15.68 trillion. This means that the combined price tag of 2015’s global counterfeit goods will be roughly one-tenth the combined value of every single product and service created and provided last year by the world’s top economy. Like I said. Great big honking wads of money. 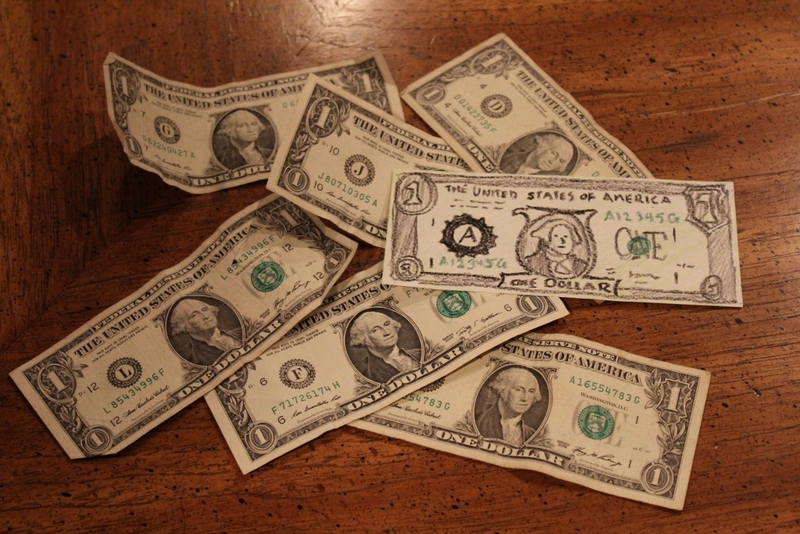 Look very carefully—can you spot the fake bill? A counterfeit is created for a singular purpose: to piggyback off an established reputation. Counterfeited products are able to mooch off existing customer bases because there are millions of people willing to purchase from a brand name they know and trust, and it’s easy to take a stamped-on logo at face value. After all, if it looks like a duck, walks like a duck, and is advertised like a duck…why wouldn’t it be a duck? The problem comes when the customer takes that duck home and finds out that someone glued a couple Pringles and a pair of fake wings onto a rabbit and called it a day. This does far worse cut into profits—it damages both the customer’s regard for and trust in that particular company. Because a counterfeit is posing as someone else’s work, that work might appear to others as a poor original instead of a cheap knock-off. Customers might give up on the product entirely because a counterfeit fell short of their expectations. And that’s more of a best case scenario! In the worst case, a customer could be injured or even killed by a poor imitation. Some counterfeit pills have been found to contain “amphetamine or speed, blue printer ink, boric acid, paint, and brick dust” in lieu of actual active ingredients. Do you prefer Sharpies…or Shoupies? In reality, we can trace the origin of counterfeiting to a moment long before the Genesis account of Eden. In fact, we can trace it to a moment that predates the very existence of humanity—a moment God inspired to be recorded in His word. That moment was the fall of the being we call Satan. In this rare glimpse into the mind of our adversary, we’re shown that Satan the devil decided long ago that his original position as the “anointed cherub who covers” (Ezekiel 28:14) wasn’t enough—he wanted the very throne of God. So he sought to become God, and instead became a counterfeit—a cherub trying to pass himself off as an equal to the Creator of the Universe. He became warped and corrupted, and God is at present allowing him to function as the “god of this age” (2 Corinthians 4:4)—a counterfeit god, seeking to deceive the entire world. But Satan is not just a counterfeit. He also functions as a counterfeiter, taking some of the most vital aspects of God’s plan for mankind and creating his own cheap knock-offs. Like the knock-offs of our physical world, these poor spiritual counterfeits damage the world’s regard for and trust in God, all while providing our adversary with the attention and worship he craves. Let’s take a look at three of these forgeries in order to understand what aspects of God’s plan Satan doesn’t want us to see. The Knock-Off: I know. I know. Zombies. How could I possibly expect anyone to take me seriously when my very first point is the living dead? But just do me a favor and bear with me on this one. Even if you’ve never seen a zombie movie (congratulations on some good life choices, by the way), you know the general plot of one: Massive quantities of the half-decayed dead are somehow raised from their graves with a hunger for human brains. They are bumbling, they are dumb as bricks, and they are hideous. It is the job of the movie’s hero(es) to either incapacitate or escape the clutches of the undead hordes. What It Says: Zombies are by and large Hollywood’s favorite way to bring people back to life, and it’s a total joke. There is even an entire subgenre of zombie comedies (called “zomcoms,” if you can believe it) designed to poke fun at a concept that was already insane from the start. Everything about the idea screams “Ridiculous!” and reminds the viewer that returning from the dead is not only a laughable concept, it’s patently impossible. What It Warps: The idea of decaying corpses becoming reanimated as zombies stands as an open mockery of the resurrections. God has every intention of bringing His people up from their graves—not as mindless, rotten zombies, but as transformed sons and daughters of God. “For the trumpet will sound, and the dead will be raised incorruptible, and we shall be changed. For this corruptible must put on incorruption, and this mortal must put on immortality” (1 Corinthians 15:52-53). And then, one thousand years after that resurrection, God will raise up all the dead, “small and great” (Revelation 20:12), as human beings with their eyes open to His truth and with the opportunity to life to its greatest and fullest extent. Satan wants to portray the resurrections of the dead as something hideous, but God designed them to be some of the most wonderful moments this world will ever experience. The Knock-Off: In case you weren’t lucky enough to attend a school where the theory of evolution was crammed down your throat with all the grace of a musketeer loading his gun in the middle of a firefight, I’ll try my best to recap. The idea is that life started so many eons ago when a bunch of stuff came together at exactly the right time under exactly the right conditions and formed a cell. Over the millions and billions of years between then and now, life grew and adapted and changed according to its environment until the world became the place we know today—but this is just a moment in that cycle, not a stopping point. Evolution will continue to shape and reshape not only the human race, but all life everywhere as it moves onward toward perfection. What It Says: You and the entire planet will only continue to improve, and it doesn’t really require much of anything from you. Nature will take care of shaping you into a better life form, and your role is simply to exist as a link in a chain. What It Warps: If the past 6,000 years of recorded history are any indication whatsoever, humanity has been doing the opposite of improving. When we’re not busy killing each other, we’re plummeting to new depths in a moral abyss. The only real difference between then and now is that we have a nicer selection of toys with which to kill and plummet, respectively. We’ve made progress, but not necessarily improvements—and while the theory of evolution essentially tells us that it will all work itself out in the end, God’s word tells us that we’re the ones who need to be working. If we want to change who we are, we need to be doing something about it. The universe isn’t just going to massage away six millennia of bad choices—that requires personal effort from us. Evolution tells us that we live, we die, and life goes on and continues changing without us. God teaches us that the only way to real, lasting change is by working with Him to change ourselves. As we take on more and more of His perfect character, the more we can look forward to one day experiencing the ultimate change—a change from flesh into spirit. That’s something the lies of evolution can’t even pretend to offer. The Knock-Off: Think for a minute about the major holidays—the ones that get all the attention when they come around each year. What are they? There’s New Years, and Valentine’s Day, and Easter, and Thanksgiving, and Halloween, and Christmas, right? What’s the overarching theme between all those days? What’s the message they send as a whole? What It Says: The holidays don’t actually say…anything, really. They’re each mostly amalgamations of a dozen different cultural abominations spanning multiple civilizations (with the exception of Thanksgiving), so lumped all together, they make even less sense than on their own. One supposedly represents the day when Christ was born, another claims to be about His resurrection, this one is about buying your significant other heart-shaped chocolates, that one is about dressing up as evil spirits and making threats for free candy…there’s precious little connection between one holiday and the next, much less the days as a whole. The biggest message of these days is that they have no message. What It Warps: God’s Holy Day plan, on the other hand, is anything but jumbled. The observances He sets forward in Leviticus 23 paint a picture of past, present, and future—of the Old Testament sacrifices, of the sacrifice of Christ in our place, of the Church’s work in the present day, of the return of Christ to the earth, and of the opportunity of every man, woman, and child who has ever lived to join the family of God. Satan has convinced the world that holidays are just days to party, while God designed His Holy Days to fill us with a thankfulness for events that have passed and an unquenchable hope in looking toward ones yet to come. Satan creates counterfeits because he is a counterfeit. He possesses no other way than to take the wonderful things God has created and then warp them as he himself is warped. His unique talent rests in twisting what is to make it appear as what isn’t. “And no wonder! For Satan himself transforms himself into an angel of light. Therefore it is no great thing if his ministers also transform themselves into ministers of righteousness” (2 Corinthians 11:14-15). Satan never was able to become like God. We can. God has invited us into His family and wants to see us make it. But whether or not we do depends on whether we’re wasting our time on a counterfeit…or spending it on the real thing. 3 Responses to "The Counterfeit God"
Much food for thought here. Keep up your writing……very informative! Excellent Post, Jeremy! Definitely makes me look at things and decide whether they are the real deal or knock offs.